Japan studio announced their brand new title for PlayStation VR: Astro Bot Rescue Mission. The game is being developed by the team who brought you The Playroom and The Playroom VR. According to the PlayStation blog, Nicolas Doucet creative director and producer at Japan Studio said: this time we took a new direction to challenge a genre that is close to the heart of many gamers out there (including us! ): platform action games! 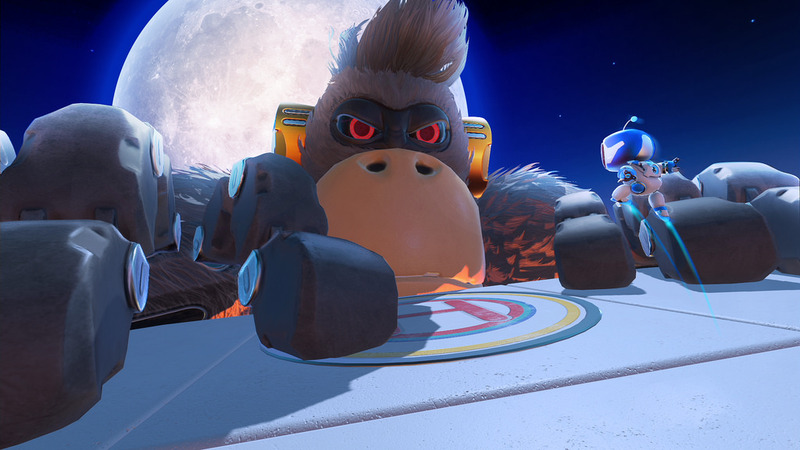 Astro Bot Rescue Mission, players take control of Astro, the Bot captain of a ship which is on a mission to rescue its lost crew, who are scattered over five different worlds. players will have to run, jump and punch their way through 26 different stages across 5 worlds, each ending with an epic boss fight. Every world you traverse ends with a huge boss battle which creates an exciting and memorable gameplay moments for the players. Imagine turning to find a 100 feet tall Gorilla towering above you, biting the building you are standing on. Also, Players will find they have the freedom to view entire sequences from below, from above, across 180 degrees of view or by leaning round corners to discover hidden pathways and secrets. The players also exist in the world as a big robot following Astro around. Occasionally, Players will have to smash parts of the environment and dodge enemy attacks. both you and Astro need to survive in order to complete this mission so it will be key to make sure that not one of your perish on this epic journey. Another cool feature of the game is the many gadgets that emerge from your DualShock 4. As the controller will be visible within the virtual world, players can make use of a hook shot, a water gun, or even deadly ninja stars. These gadgets will be found on player's path so keep an eye out for them. Players will be looking for their lost crew and there are 8 lost bots in every stage. Clues as to where they may be hiding will be heard by the 3D audio within the PlayStation VR unit that will add another layer of depth to the title. Players can explore rich and unique locations including city rooftops, sandy beaches, volcanoes and even inside the belly of a gigantic whale, there is plenty of variety to be found within this game with a 360-degree field of vision. The sense of the scale in PSVR really is amazing. The hardware is a perfect match for Astro Bot Rescue Mission. Though there is no release date information at this time a short trailer has been released which you can find below. We will be sure to bring you all the latest on Astro Bot Rescue Mission in the future, so stay tuned for more and don't forget to share.